Everyone knows New York City , even if they have never been there. But the real thing is ten times more exciting and there is so much to do. Be dazzled by the excitement, diversity, glamour and fun of New York City, the city that never sleeps. The astonishing variety of attractions in this Entertainment Capital of the World range from world-class theatre, music and museums to world-champion sporting events. Discover magnificent architecture, breathtaking performances, marvellous shopping, and treasures of art and culture, as well as superb cuisine, from every corner of the world. You will love New York City! 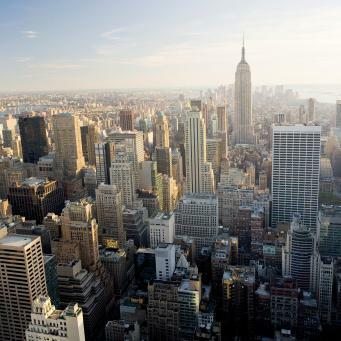 Here are just some of the fantastic venues to visit during your stay in the Big Apple. Rockefeller Center, "Top of the Rock"
We depart London Heathrow on a British Airways scheduled flight to New York JFK. A coach transfer to Manhatten will see us arrive mid afternoon at the luxurious Sheraton Hotel in 7th Avenue. The rest of the day is yours to relax, settle in and find your bearings - easy to do with the island’s simple grid system of parallel avenues, stretching from downtown south to uptown north, bisected by numbered streets running east to west. After breakfast, we take an orientation tour of Manhatten that will take you around many of the sights you will want to examine in more detail and at your leisure later. These include Greenwich Village, Washington Square and fashionable Soho, the Woolworth Building (New York’s tallest before the Empire State was built) and Chinatown. In Lower Midtown there is the Empire State itself and over on the East River side the impressive United Nations building. The rest of the day is free for you to explore. 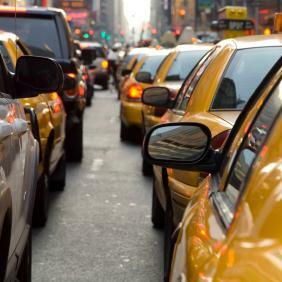 A day to explore New York at your own pace, take in a city tour, or shop in some of the fabulous stores, including Macys. Another day to do whatever you want, when ever you want it! A morning spent finding those last minute presents, before we reluctantly head out to JFK Airport mid afternoon to check in for our mid evening flight back to London. Arrive back in to London Heathrow. Concierge Desk, 24-Hour Room Service, Laundry Service, In-Room Massage Treatments, Dry Cleaning Service, Valet Service, Massage Treatments, Wake-up Service Available, 24-Hour Concierge Service and Safe Deposit Boxes.